The only thing the all-new Rogue Sport and Rogue have in common is a name. A week before the 2017 Detroit Auto Show, news broke that the Nissan Qashqai would be making its way over from Europe to the US. Now on the first day of the show the Japanese automaker has revealed this, the Rogue Sport. Yes, the name “Qashqai” has been dropped in favor of something Americans are more familiar with. But just because the Rogue and Rogue Sport share a name doesn’t mean the two are identical. Unlike the recently refreshed Rogue, targeted at young families, the Rouge Sport is for singles and couples. The new Rogue Sport is also smaller than its namesake. Its wheelbase is 2.3 inches shorter, overall length is down 12.1 inches and it’s 5.6 inches shorter. When seen side-by-side the differences between the two models are apparent. In addition to being more compact the Sport has a different design, with the front and rear ends receiving substantial makeovers. The lone power plant on offer is a 2.0-liter four-cylinder making 141 horsepower and 147 lb-ft of torque, a substantial drop in power from the Rogue’s 2.5-liter four-banger rated at 170 hp and 175 lb-ft of torque. The only transmission on offer is a CVT, but Nissan is promising the drive will be somewhat sporty thanks to independent front and rear suspension. Further sportiness can be achieved by setting the electronic power steering to, wait for it, Sport mode. There are three trim levels to choose from: S, SV and SL. Each can be had with either front-wheel drive or all-wheel drive. The interior of the SL trim looks especially nice. Standard features include a 7-inch infotainment screen, heated front seats, 19-inch wheels and a leather-wrapped steering wheel and shifter. The backseat does look a bit cramped but should you ditch your friends and fold the rear seats cargo space increases from 22.9 cubic feet to 61.1 cubic feet. Nissan’s full suite of safety features and driver’s aids are available, including the Around View Monitor with Moving Object Detection System (curb cam plus object alerts). Pricing details were not given but we have a good idea of what this car will cost. The Rogue Sport slots between the Juke and Rogue, with the former having a starting MSRP of $20,250 and the latter priced at $23,820. Nissan said it will hit dealerships in the spring of 2017. The Qashqai, which is what the Rogue Sport is, has been a hit over in Europe and we expect it to be a hit stateside. 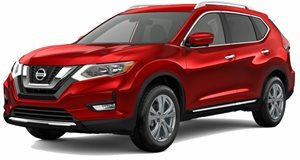 The only thing it really has in common with the Rogue is its name, which should ensure that buyers don’t get crossover fatigue.